Former MBTA chief Beverly (Not My First Rodeo) Scott has been nominated by President Obama for a spot on the National Transportation Safety Board, which should make every U.S. traveler feel a little less safe today. Scott fled Boston several months ago after the T’s winter meltdown caused the system to grid to a halt. Big local news, eh? Well, not in the Boston Globe, which has nothing in today’s print edition but did post a web piece this morning. 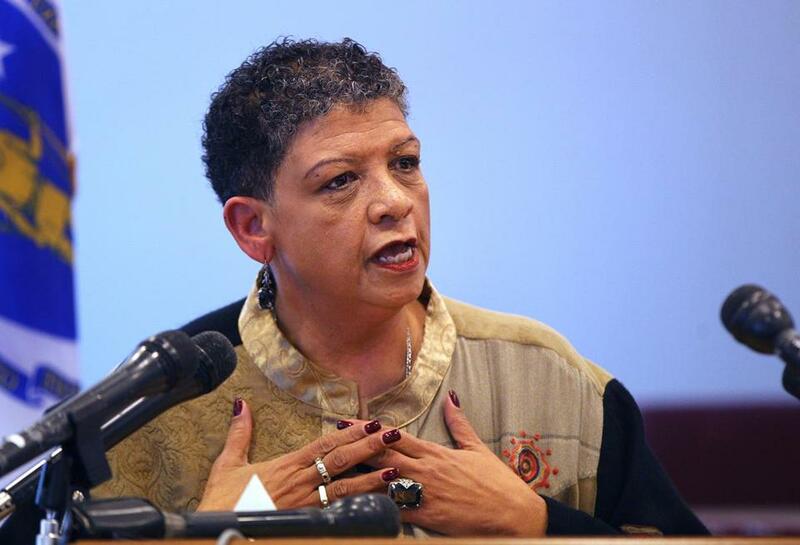 Former MBTA chief Beverly Scott could soon join the National Transportation Safety Board, a position that would give her oversight of plane crash investigations and accident prevention in the sprawling US transportation system. President Obama announced his intent this week to nominate Scott for the five-member panel. Such appointments require Senate confirmation and carry five-year terms. The NTSB’s safety purview also includes pipelines and marine travel. Scott resigned from the MBTA in February amid a frustrating winter for the agency. Trains were canceled and delayed repeatedly amid a rash of breakdowns and mechanical failures that accompanied a series of extreme snowstorms. As Scott left, she complained of chronic underfunding of the agency, which she said had made it difficult to maintain the system. That’s it? After all local riders went through? 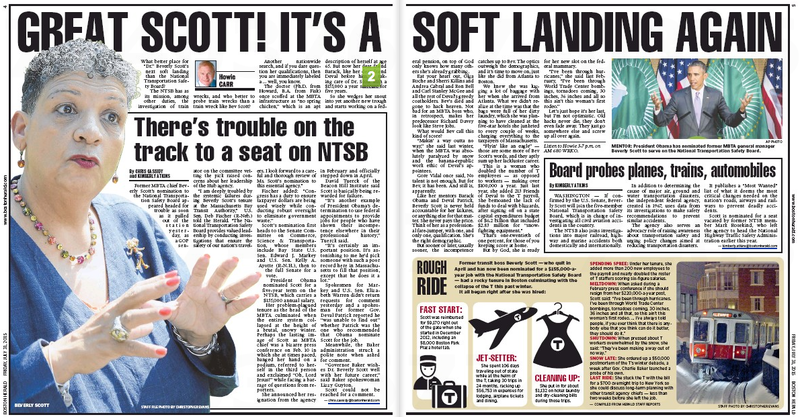 Not surprisingly, the Boston Herald more than made up for the Globe’s reticence, giving Scott the expensive two-page spread (with bonus Inexplicable Little Green Number). The frosty local tabloid also tossed in an editorial for good measure. We were prepared to forget all about Beverly Scott and her unfortunate tenure as general manager of the MBTA, but President Obama’s decision to give her a soft landing has changed that. After a long career in transportation management Scott may well have the qualifications on paper to serve as a member of the National Transportation Safety Board. But she brings with her to the $155,500-a-year post a trainload of baggage. Now that’s the Massachusetts Bev Transportation Authority we know and don’t love. This entry was posted on Friday, July 31st, 2015 at 1:19 pm and is filed under Uncategorized. You can follow any responses to this entry through the RSS 2.0 feed. You can leave a response, or trackback from your own site.